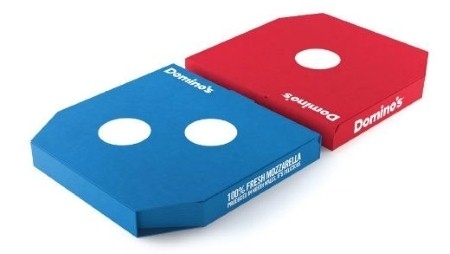 Pizza giant, Domino’s has introduced new pizza box that makes red and blue domino logo pivotal to the pack design. The new packaging, designed by branding design agency jones knowles ritchie (jkr), uses the brand’s combo two pizza deal as a canvas to bring the logo to life with one red box and one blue box. jkr was briefed by Domino’s to create a fresh design for its pizza boxes that would increase consumer engagement and make an instant, recognisable and shareable impact from the moment they arrived on the doorstep. While researching the brand, jkr discovered that 96% of all Domino’s pizzas sold in the UK are sold as a pair, due to the numerous ‘two for one’ and combo deals offered to consumers. Taking this knowledge and the visual trigger of the brand’s name as inspiration, jkr transformed the logo into the pack itself, creating a blue and a red box to be delivered as a pair. All generic category information has been removed from the boxes, and the packs now only feature limited product information on the side of each box, detailing the quality of the pizza ingredients, such as 100% fresh mozzarella. High quality ink was also used on the boxes to ensure heat from the pizzas didn’t affect the design or the box, and the boxes are all 100% recyclable.